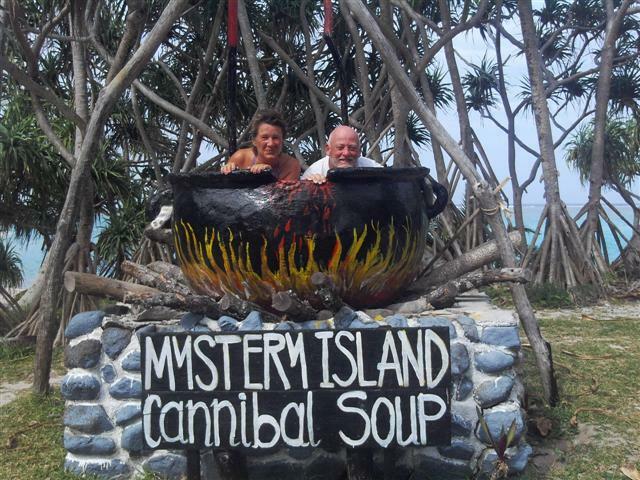 The passage from Fiji to Vanuatu took 3 1/2 days, it was James’s first blue water ocean passage. 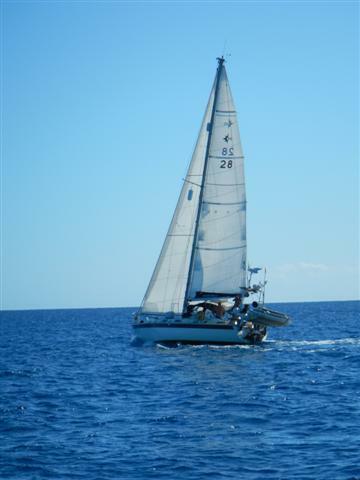 We motored out of the reef with Norman and Sara on Norsa and Geoff on Seafauke who took some great pictures of Camomile with her sails flying. I ran a net in the evening and had about half a dozen boats to call and take their positions and weather reports. 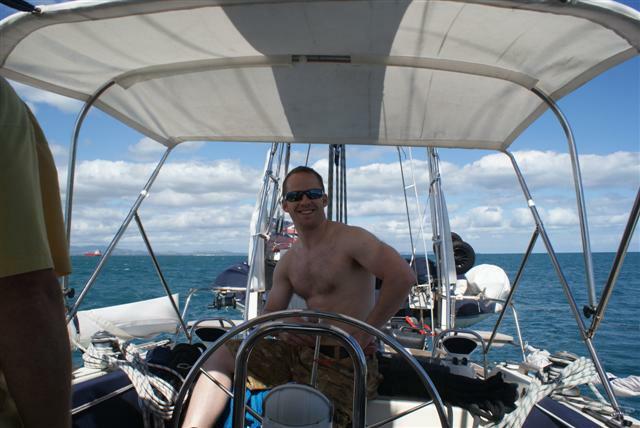 We had a good wind but unfortunately the sea was a bit lumpy and James took to his bunk. By the third day he was getting really bored but fortunately he managed to catch a yellow fin tuna, he managed to catch a second one but it got away. On the forth day James spotted land first and by 3pm we had motored around the south side of the reef and anchored in Anatom, James jumped straight in the water for a swim. 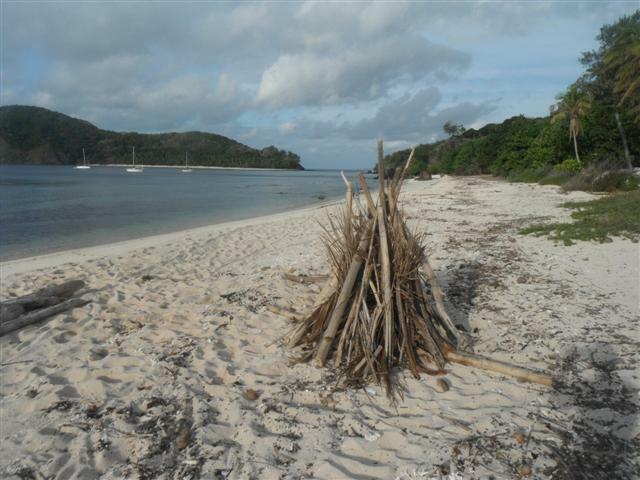 Anatom is the most southerly island of the Vanuatu group and has for a long time been overlooked by many yachts because it lacked any check-in authorities and the sail back from further up the chain against the prevailing South Easterly would be a hard flog at the best of times. This has now changed so we waited quietly at anchor in the protected lagoon behind Mystery Island and recovered from the passage until the following morning when the local policeman came to process us. 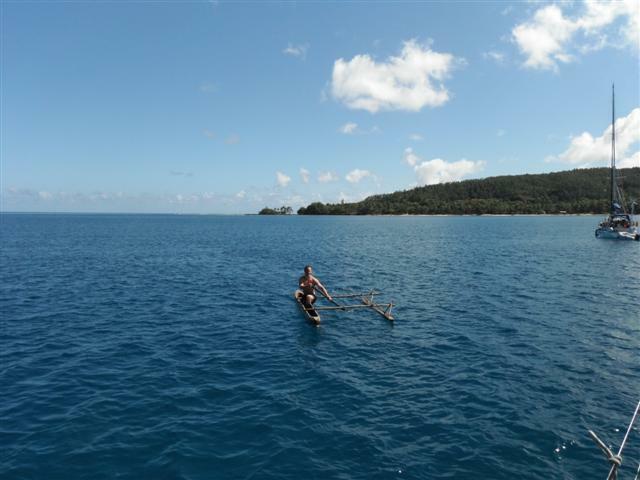 We had several local people approach the boat in dug out canoes offering fruit and veggies and James couldn’t resist having a try out in one of the outrigger canoes. It was more stable than he was expecting. 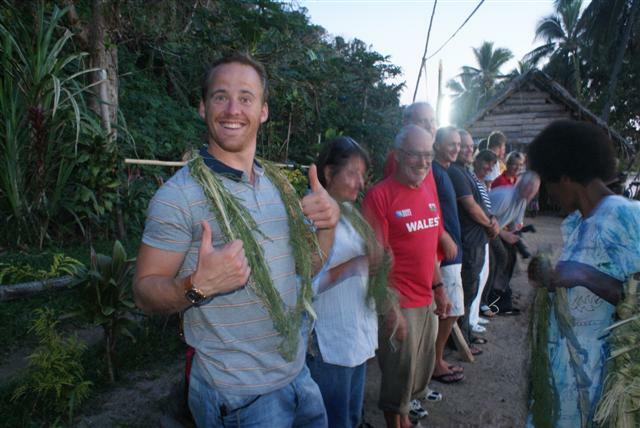 There were enough yachts in the anchorage for the local tribe to roll out their recently conceived welcome evening, which started with a presentation of leis, a welcome song, and displays of traditional skills like making fire with a stick and tinder. 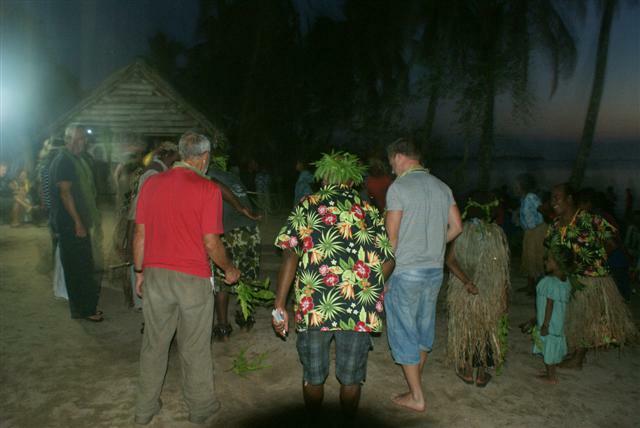 This was followed by traditional dancing, after which we were encouraged to join in, and a banquet of locally prepared food. This was their first and so we were the guinea pigs but it was an honest and enjoyable evening that was a great success. Mystery Island turned out to be a contrivance for the occasional cruise liner but despite this there was good snorkelling to be had and a pleasant walk around the perimeter of this small sand cay with an airstrip down it’s middle. We found this set up in the middle of the ‘market’ square. 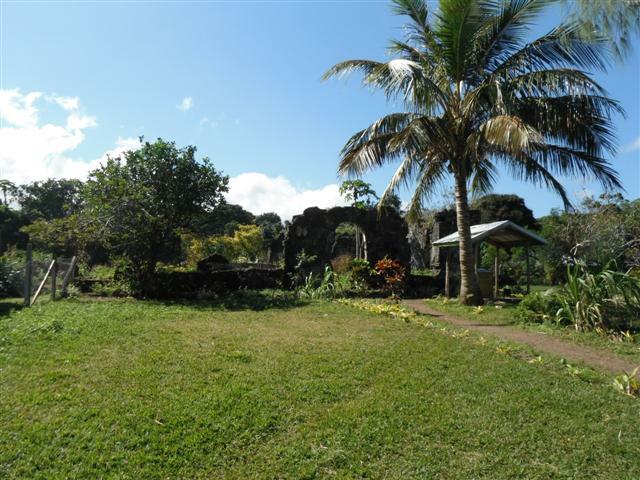 Meanwhile, on the mainland, the village featured a church ruined by an earthquake while, in front of it stood a “reconciliation” monument to missionaries killed shortly after their first arrival in these islands. And, yes, without cast down eyes, shuffling feet or mumbling we were told, “they were eaten”. Interesting if slightly worrying for the casual visitor that there are those in the community who can recount this heritage entirely without trepidation. 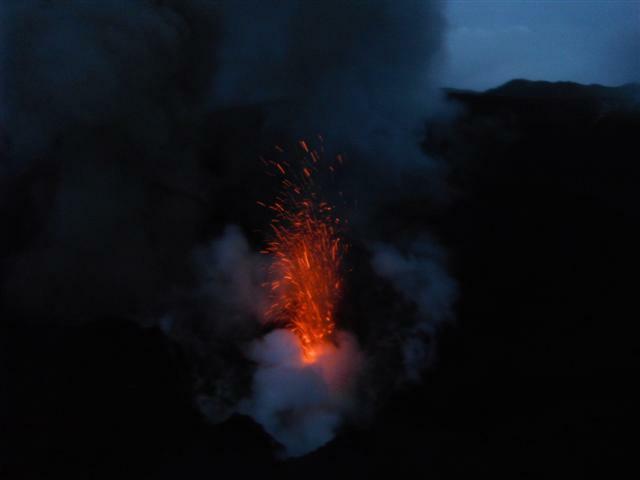 After a long day sail we arrived at the island of Tanna and it’s active volcano, which was the highlight of this leg both for Bill and for James who is interested in geology as part of his Open University work. The anchorage at Port Resolution was thought by Captain Cook to have promise as a harbour because when he named it, less than 200 years ago it was deep. We anchored in good holding in about 7 meters, which due to the land being pushed upwards, is a lot less than the captain found on his lead line. As we approached we observed seawater steaming in some areas and could hear the roar of regular eruptions. 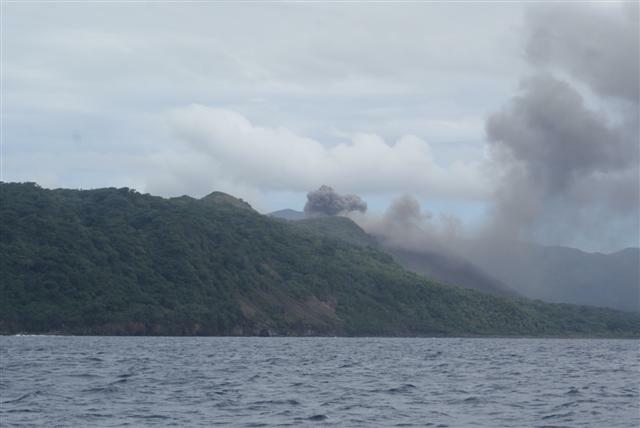 Tanna was talking to us at level 3 of 5 where a 5 means evacuate or get hurt. The trip to the crater is a 40 minute 4×4 pickup ride along tracks which look like something from the set of an extreme off-roader commercial. The ladies swiftly ensconced themselves in the cab, leaving the four men in the back where low hanging boughs swept just inches above our heads, the torrential rain, full of black grit, permeated every crevice of our clothing, and the ride bucked and rolled in a spirited attempt to liberate itself of the human cargo hanging on to it for grim death. At last, and quite suddenly, the rain stopped, the jungle gave way to a vast black ash plain and the driver pulled over and parked. 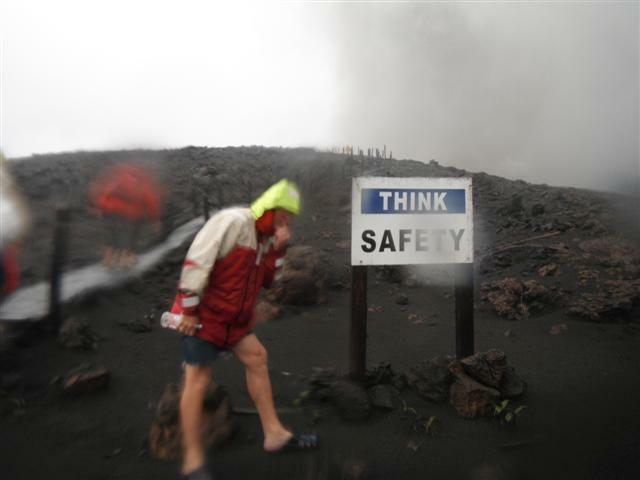 I don’t really know what I expected, barriers, informative multiple signage, a briefing on how to avoid getting hit on the head by descending molten magma perhaps. None of the above were present, just a solitary sign proclaiming “Think Safety”. 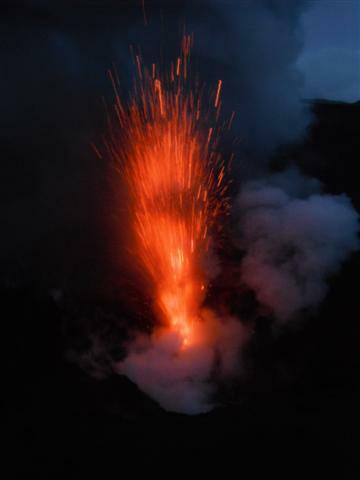 The driver told us to walk up the slope to the crater and then turn right but to avoid the choking fumes we turned left and went higher and higher to the accompaniment of nerve grinding booms which we could now feel through our feet. Awesome is a word that has been hijacked by generations of comic books finally becoming an adjective applied to the latest and perfectly banal mobile phone or a new ipod case. These things are not awesome but looking straight down into a crater watching lumps of magma half the size of a car being hurled hundreds of feet into the air certainly is awesome. James was suddenly 5 years old again. Shrieking and yelling he took off at a run, hundreds of feet right up to the highest point of the crater. Sue and I, clinging to each other for moral support with me pretending not to be scared witless, made our way up about half way before we realised that the splodge shaped rocks strewn around the gravelly ash slope we were picking our way through could only have been created in one way. 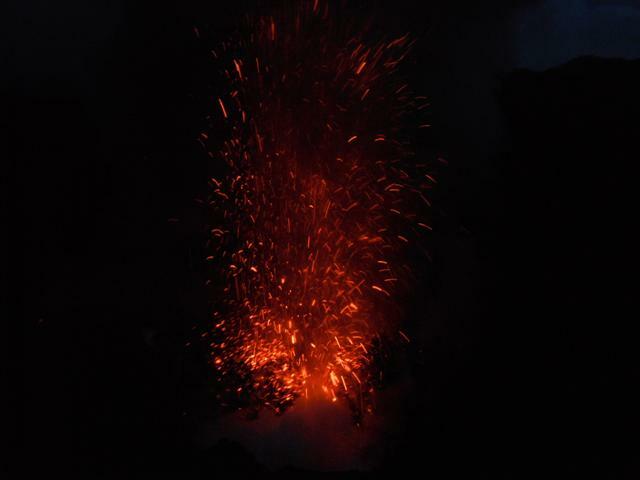 We stood our ground however and, as darkness gradually shrouded us, the explosive emissions of glowing molten rock gave us the show of our lives. We returned to Camomile in darkness and shed our wet and gritty clothing hoping that the heavy rain would get the black ash out of it. Wrong, the following morning our decks were covered in this abrasive grit, which had got everywhere. We spent 3 hours sluicing the boat down in attempt to get it away from winches and cars. Even the nearly new stainless rigging was showing orange streaks in the acid rain and I could swear that the Treadmaster deck looked even more threadbare than before. It was definitely time to leave though sadly we had to part company with our good friends Norman and Sara as they made their way back to Oz and a flight home to the UK. Our next and even more poignant goodbye was to James who picked up a flight from Port Vila three days after we checked in at the capital. He had recharged his batteries, eaten lots and was set for some skydiving in Fiji as he passed through there on his way back to the UK. 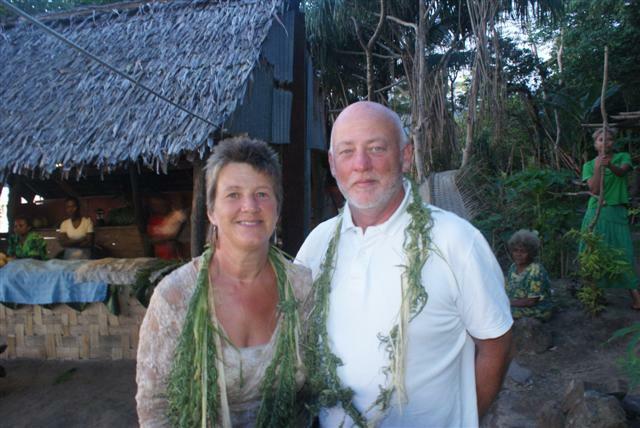 We turned up at the hot and humid arrival hall of Fiji’s Nadi International Airport with at least 2 hours to spare but we were both so excited about the arrival of James that we were far too keyed up to sit around Port Denerau where the boat was moored. 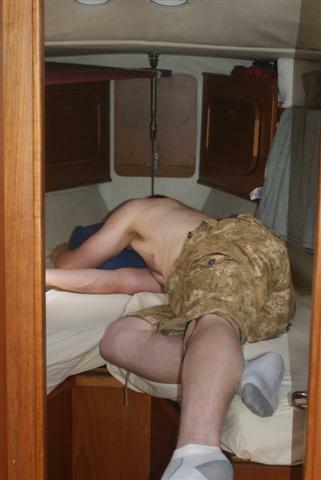 This would be the first time I had seen my son in 3 years and though Sue had seen him just last year on a brief visit home this was the first time he had been on the boat since well before we left. We also knew that he needed the well-earned 6 week break he was taking from his busy life. We took a pause to purge the jet lag and reacquaint ourselves with each other. Both of us being engineers, work on the diesel’s cooling system for which James had brought some much needed new parts with him from the UK and then we were off. 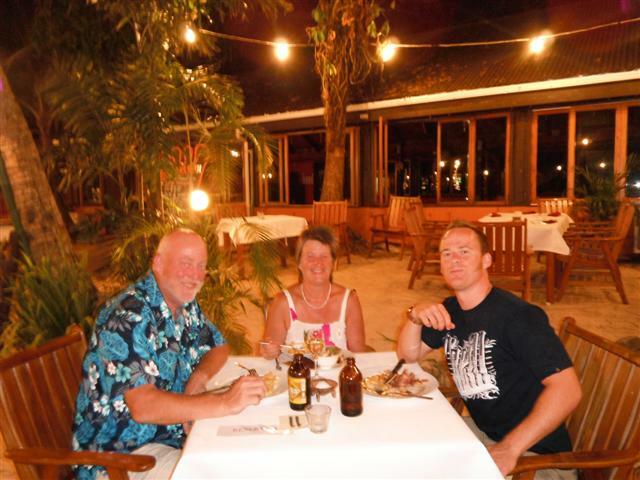 We started with an overnight stop in Vuda point to take James to the First Landing resort and our favourite place to eat. Our waiter friend Norman (name) found us a good table and served us with the usual delicious fare we had enjoyed before. James agreed the food was wonderful. 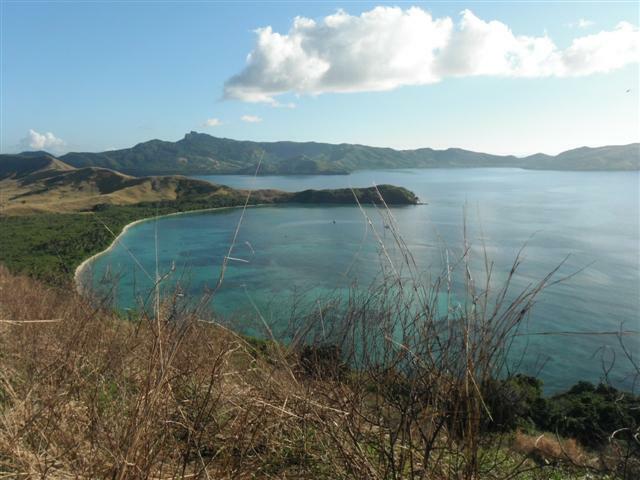 We had visited this western side of Fiji and the Yasawa group of islands twice before and were dying to take James to see all the best bits. 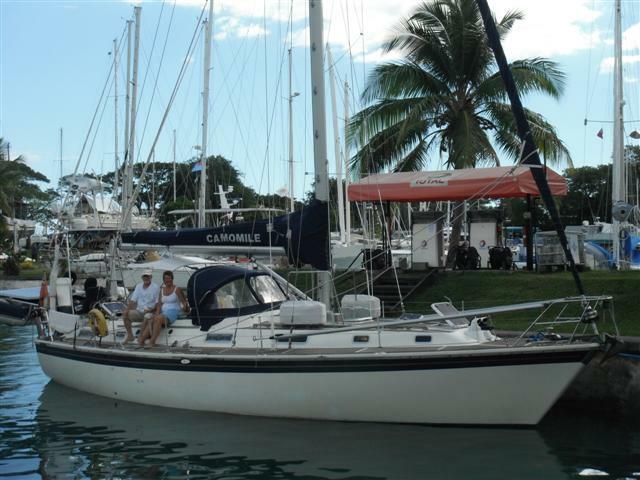 Having rendezvoused with Norman and Sara on their Malo 36, just before sunrise we gently motored out of a quiet bay near to Lautoka and made the day passage northwards skirting Bligh Water. This stretch of water was named after the infamous captain who, in his open boat, was chased through here by war canoes, into the Tamasua Passage. After a long day sail we arrived at our first village anchorage at Nabukaru sheltering from the trade winds behind Sawa I Lau island. Anchoring up over night we went ashore the following morning with the traditional offering of Kava root (a pepper with a mild euphoric effect when ground and mixed with water) for the village chief. This gesture is always well received as it marks a sign of respect by the visitor for their culture and, though the days are long gone where protection is needed, grants you their blessing to freely visit their homes and territory. 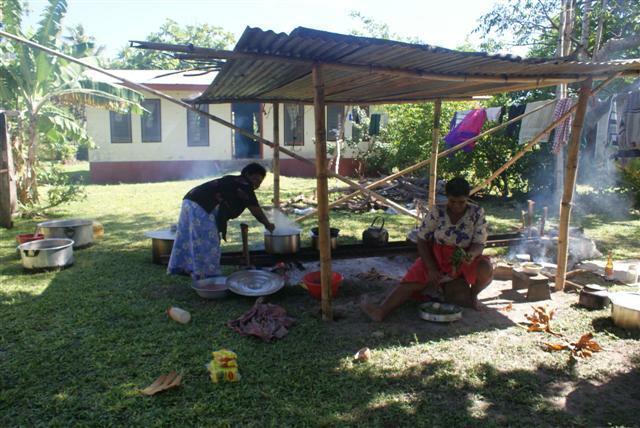 The lifestyle here is basic and though the houses are often block work with corrugated iron roofing some traditional huts, made with local materials from the surrounding jungle can still be found among the overcrowded living conditions of the newer buildings. 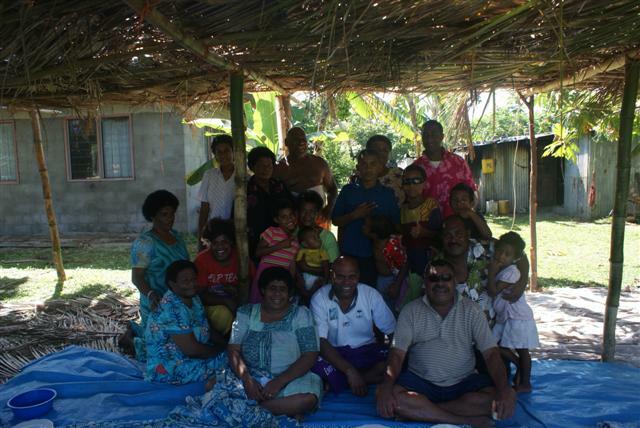 Fijians have the readiest smiles of all the peoples we have met yet on our travels. They are fun and love you to join in. 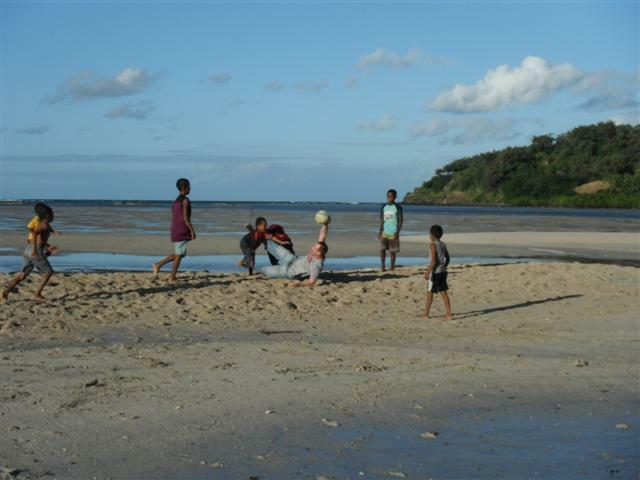 James had a blast playing football with kids on the beach and touch rugby with the men, who were keen followers of the World Cup via radio, on their improvised pitch at the school. 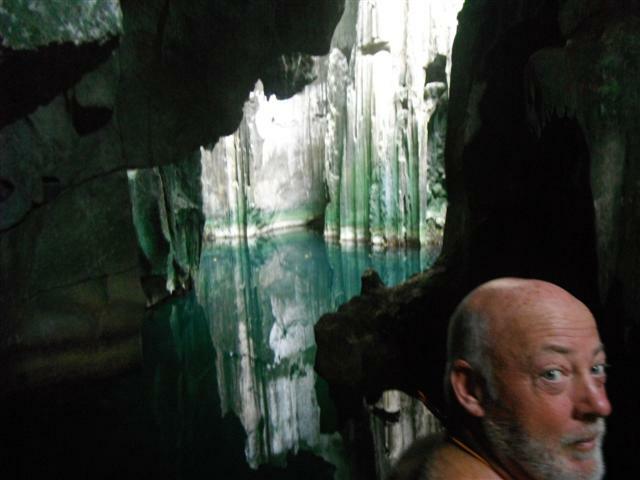 A visit to swim one of the nearby limestone caves ducking under a flooded passage to emerge in a creepy chamber with a vertical shaft letting in just a dim vestige of sunlight to penetrate the gloom was a first for Sue. Underwater caves and spiders, well done her! Sailing south now and starting mid morning ensured that the sun was high and behind us so that we could navigate the reefs by eyeball. The charting for the outlying islands is crude, inaccurate and incomplete so this is the only reliable method to use although I have found that Google Earth with its detailed photographic images, which clearly show the reefs, is incredibly precise if you can arrange to download the area you are in. After the 11 mile hop we anchored up in Blue Lagoon named after the original movie of the same name that was filmed here. We had come to pay a visit to Sani and her lovely family who had been so kind to us on our last visit almost 2 years ago. We all received a warm welcome though sadly Ratu Saleem, the old chief who had so impressed us before with his worldly wisdom and intellect, had passed away. We stayed for Sunday and went to church which is an uplifting experience by the sublime and enthusiastic harmony of the congregation’s singing. 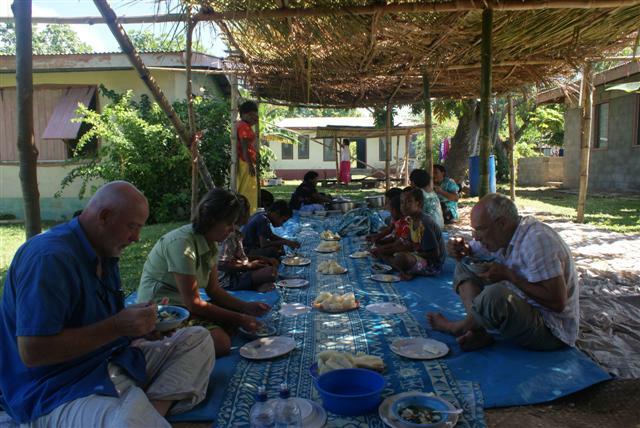 Sunday lunch was prepared and eaten in the open air together with the whole of Sani’s extended family and James, who had been scuba diving off nearby reefs, turned up to regale us with tales of his latest adventure instantly disappearing under a host of small black bodies wanting to swing from his arms as he spun them in circles. There was a sad goodbye to this kind and generous family, as this was likely the last time we would see them but time pressed on and we sailed another short hop south to anchor in Narewa Bay surrounded by miles of curving white sand beach against a backdrop of jungle and swooping mountainous ridges. The view across Narewa Bay from the top of the hill James climbed. The jungle and hills were too much for James and pack readied he made off with a machete to plough through the jungle and on up the steep slopes beyond while his old man looked on from the deck of the boat and wondered how many times he would run out of puff if he tried to do that. Across the narrow isthmus, in a lagoon, a WW2 plane wreck can be found in around 3-4 metres of water on a sandy bottom. 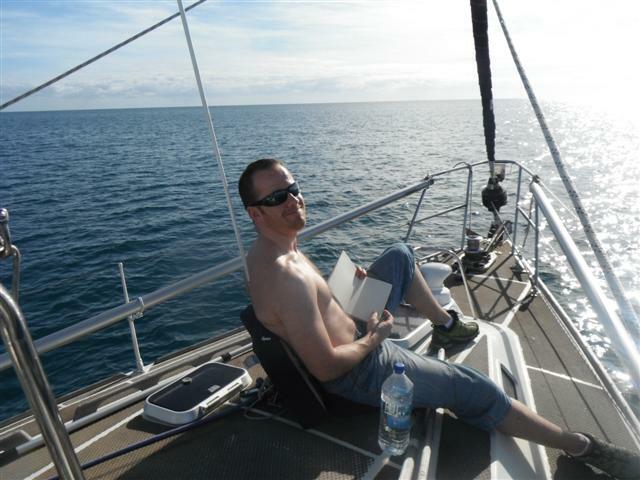 After we had inspected this we sailed south again to the nearby Manta Ray pass. 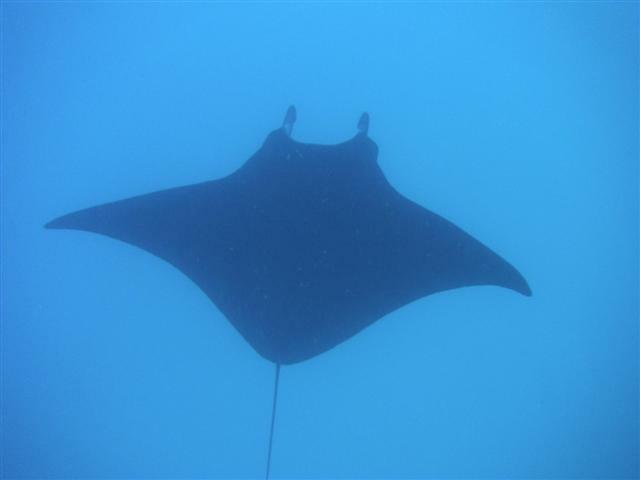 As the name suggests the huge rays, often more than 4 meters across, are sometimes seen here. They are gentle, graceful creatures that come to feed on the small organisms carried by the currents sluicing through the pass and can be safely shadowed at a respectful distance with just a snorkel and mask. We were in luck and James was treated to the rare and exciting experience of swimming and free-diving with these amazing fish. Our next stop was south of the Yasawas in the Mamanutha group, by the island of Navandra, uninhabited except for a goat. Some of Fiji’s best coral lies beneath the stunningly clear sea in the bay and exploring the deserted beach here and on the island next door was a lovely adventure. James decided to build a big fire in honour of my birthday, which we celebrated while there, but decided not to light it. It was to be our last taste of the rustic outlying islands with our next stop being the Musket Cove resort on Malolo Leilei. With Camomile med moored stern to a modern pontoon which forms a bridge to a tiny palm covered sandy island with a bar and a range of driftwood fired BBQs we put our feet up for a few days after our recent adventures. Civilisation is welcome when it comes in this form. 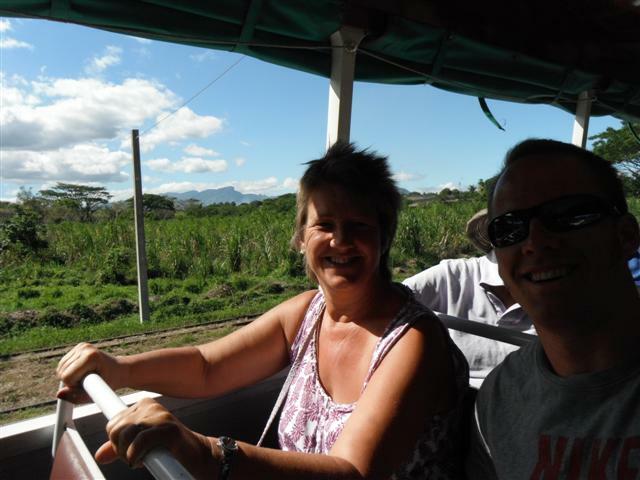 We returned to Vuda point where Sue and James decided to go into town on a local bus, windows aren’t necessary. 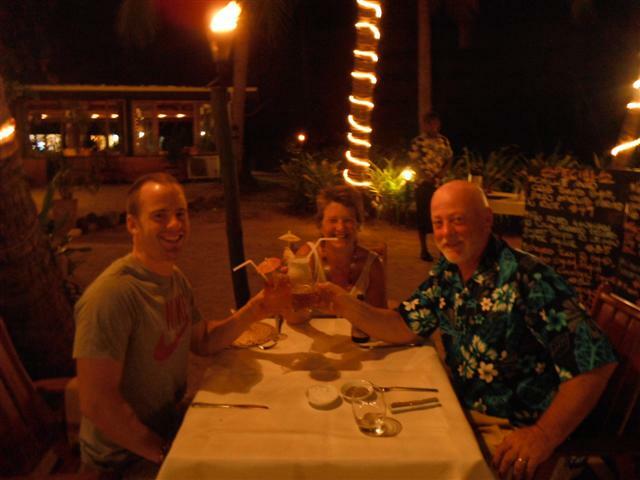 We had a final meal at First Landing followed by a dance show performed by some locals with a wonderful photo opportunity afterwards for James. Time was moving on and so should we. Sadly it was time to bid a fond farewell for probably the last time to Fiji’s shores, one of the most beautiful countries on our travels so far.